Energy can be released in chemical reactions as light, sound or electrical energy. But it is most often released as heat energy. This allows us to easily measure the amount of energy transferred. Measuring heat transfers is called calorimetry. 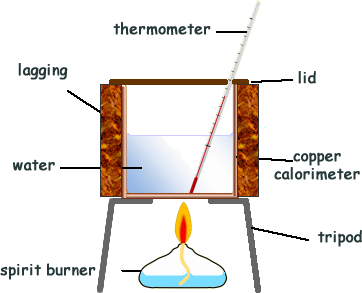 The diagram on the right shows a very simple calorimetry experiment to measure the heat energy released from burning fuel. The spirit burner containing the fuel is usually weighed before and after the experiment. In this way, the mass of the fuel burned can be found. Heat losses and/or gains are reduced as much as possible by using a lid, having the calorimenter as shiny as possible and lagging for the equipment. More reliable results can be obtained by repeating the experiment many times. The biggest source of error in calorimetry is usually unwanted heat loss to the surroundings. This can be reduced by insulating the sides of the calorimeter and adding a lid. For a given amount of water heated up, the greater the temperature rise, the greater the amount of heat energy transferred to the water. For example, twice as much energy is transferred to the water to achieve a temperature increase of 20ºC compared with 10ºC. This results in energy exchanges. Energy is absorbed to break bonds - Bond-breaking is an endothermic process. Energy is released when new bonds form - Bond-making is an exothermic process. Whether a reaction is endothermic or exothermic overall depends on the difference between the energy needed to break bonds and the energy released when new bonds form. What is the energy transferred to 100cm3 of water to raise its temperature by 20ºC ? It is also useful to remember that 1 kilojoule, 1 kJ, equals 1,000 J. So the energy transferred is 8.4 kJ.